Our RV came equipped from the factory with an integrated Transfer Switch and Electrical System Protection (ESP) unit supplied by TRC (Technology Research Corporation). Their Surge Guard® portable units are common aftermarket products. The unit found on our RV is sold to RV makers and it selects between the Utility AC (Shore) power line coming from the campground power pedestal or the RV’s on-board generator. It monitors the quality of the AC power coming in and provides continuous power surge protection. When shore power is connected to the RV, the unit checks for proper polarity, the presence of both a good ground and neutral connection, proper line frequency and that the AC voltage is within the 102 to 135-volt range. In addition, it continuously monitors the voltage providing a digital display of this voltage on the main unit and on a remote display panel which also includes a limited bypass function. This is a comprehensive protection system. As the saying goes, this system is great until it is not. We had dry camped the night before arriving at a Rally and prior to that we had been in a campground connected to their power. Everything had been normal. We usually check the voltage on the system’s remote panel after connecting to the campground power pedestal to confirm that we "have power”. After connecting our power cord, we did not "have power”. I had noticed when connecting my 50-Amp cord to the pedestal that there was a new 30-Amp power outlet and new 30-amp circuit breaker. My immediate thought, when there was no power, was that it was likely that the old 50-Amp receptacle or breaker were defective, since everything was properly connected and ‘On’. Before calling the office, I checked the pedestal for power on each leg of the 240 Volt outlet using my Multimeter. Everything checked out as being OK. The next area that I checked was the point where power goes into the coach electrical system, which on our RV is in an area underneath the bed, in a bedroom slideout. Accessing this area is a little challenging however, once I removed the covering panel, I noticed that there was no voltage reading on the system box (such as the one shown in the first photo). 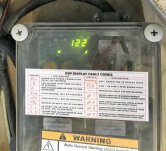 After removing the power line cord from the coach pedestal, I removed the clear plastic cover of the transfer switch/ESP and then had an assistant reconnect the line while I checked for the presence of incoming power (indicated by the yellow arrows near the bottom of the photo). At that point I had power coming into the transfer switch, but none going through it to the RV (green arrows show the coach connection). Removing the line cord once again, I started the RV generator and after the usual delay, our coach had power (both at the area shown by the blue arrows and that shown by the green arrows). This process had identified that the problem was with the automatic transfer switch. The black relay on the left in the photos that controls the power to the coach when plugged in, had failed. We knew that the coach needed to have power for the week to keep the batteries charged and with warm weather predicted, to use the air conditioning system. A solution needed to be found. I already knew that this original equipment unit was not repairable and that it was designed to default to allow power from the generator to pass through without requiring a relay to operate. This knowledge provided me with the information I required to make a short term fix and pointed me to correcting the problem for the future. The solution at the Rally was to move the incoming ‘utility/shore wiring’ (3 heavy wires and ground (yellow arrows) to the generator side of the switch (blue arrows) and leave the generator wiring disconnected with all bare wire ends properly covered and protected). I was able to do this and in a few minutes; when the shore power was reconnected, the system sprang to life and the RV had power as before. Thinking about the issue, I recognized that for the RV maker, an integrated transfer switch and Electrical System Protection unit made sense. One set of connections in one ‘box’ provided all that was necessary. However, the weak link (proven by the number of reported failures and replacements) is the transfer switch. In my opinion, this system was prone to transfer switch failure because it defaults to the generator and requires a relay to be activated (automatically within the system box) to provide power from the ‘shore power’ source. When one thinks about the number of times the RV is supplied power by the ‘shore line’ versus the number of times it is supplied power by the generator, this design has a fatal flaw. Every time the shore power is connected the relay has to function whereas when the generator is used, its power is already connected after the short 15-20 second requisite delay. My coach had sat on a dealer’s lot for almost two years before I bought it, so one can only guess at the number of times it was moved and connected to ‘shore power’ before we took delivery in addition to vast majority of the times I have used it on shore power. In my opinion, a better design would be to have the unit default to shore power and activate the transfer relay on generator use. The second flaw is that this unit was not designed to be field repaired, (or as it turns out) repaired at all. As a discontinued product, replacement is required. I have seen the replacement unit in other coaches that experienced the same failure and it is larger in size, has a different footprint (meaning connections need to be moved around and the remote panel (and often the interconnecting wiring) also need to be replaced. The heavy wiring used in 50 Amp application is very awkward to work with, the space where the ‘box’ fits is tight with little space and the new remote requires a larger cut-out in the control cabinet. Prior to January 2016, the phone cable that interconnected the remote to the main box would have had to be replaced, however TRC finally came out with an adapter, since running a network cable from the back to the front of a large RV is a monumental task. Before jumping into replacement of the whole unit, it makes sense (both intellectually and ‘cents’) to simply replace the transfer switch with a new one and retain the existing ESP to continue to do what it was doing now that I had switched the shore power to the generator side of the transfer switch. I talked to Technical Support at TRC and they confirmed that all of the protection features including surge protection were provided no matter which power source was utilized. Let’s examine this alternative since for many this is the most cost effective and energy effective solution. There are a number of good quality standalone transfer switches available. In the next TechTip, I will provide the name of the one I ultimately decided upon along with my reasons for selecting it; there are others. 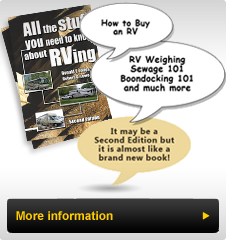 Your RV service shop can make recommendations. A licensed electrician may also be able to give you a recommendation as well, since back up power transfer systems are more common even in ‘stick houses’ today. It is always best to have someone with specific electrical knowledge, such as a licensed electrician, make the wiring changes, especially if you are unfamiliar with proper wiring techniques, procedures and regulations. All AC power to the RV must be turned off and the inverter should also be turned off (some would say disconnected). Before removing any wiring carefully label the wiring cables coming into the existing box. (Coach, Utility/Shore Power and Generator). One lesson learned in reworking the wiring on our RV is to ensure that the factory prepared wiring is not nicked or damaged. On the Utility/Shore wiring, one of the ‘Hot’ wires had been nicked when the outer rubber covering was removed in production. This nick would have provided a path to ground when installed in the new transfer switch’s metal box. Each of those wires was covered with heat shrink to eliminate the potential of a short circuit. Checking all of the wires will remove any risk. Installing a new transfer switch requires that the existing Utility/Shore connection be removed from the TRC ESP unit and connected to the Utility/Shore position on the new transfer switch. The Generator wiring is also removed from the TRC ESP unit and connected to the Generator position on the new transfer switch. The Coach wiring remains connected to the TRC ESP box and a new short jumper wire about two to three feet (0.6 to 0.9m) in length of 6 gauge / 3 wire (plus ground) known as 6/3 copper wire is connected to the new transfer switch in the Coach position. The other end terminates at the Generator position on the existing TRC ESP unit. Electrically, by making this change, the defective internal transfer switch has been bypassed and all functionality of the existing system has been retained. Ensure that all connections are tightened as specified and that all ground connections are connected to the junction point for ground wires. At this point you should ensure there is no metal objects or tools near the exposed transfer switch and TRC ESP. Test the system by having an assistant reconnect the Shore power cord to the campground pedestal and turn on the 50-Amp circuit breaker. After a few seconds of delay, the monitor panel inside the TRC ESP should show the line voltage after the system goes through all of the tests. Turn off the power and repeat the test with the generator running and in this case there will be a 15-20 second delay, then the transfer switch relay will activate and the TRC ESP will display the generator voltage. Turn off the generator. The final test involves setting the AutoGen function on the Generator remote panel, then removing the Shore Power and waiting for the generator to start and begin to provide power to the coach. After all tests are completed, with satisfactory results, power should be disconnected, all covers should be reinstalled and all wiring was checked for secure mounting. If the unit is mounted in a bedroom slideout, ensure that the slide mechanism and wiring are clear of each other. The final steps are to turn on the inverter, connect to the power pedestal and check that the Remote panel is reading the incoming voltage. Reinstall the covers over the area and enjoy your updated electrical system.